Hi Athena, that is a lovely feline pose you have there, best paw forwards. The red seems to accentuate your markings and colours, makes for quite a lovely selfie. That's such a lovely pose, Athena. Stunninlee purrfect *easy* selfie Athena!! Mee sure missed you last week. My human says that that was one of Sparkle's favorite poses. Such a beautimous selfie today Athena! You're saying, "Kiss my paw!" Wow! That is one long arm, Athena! But great selfie. What a great pose, sweet Athena! Awesome selfie! What a gorgeous kitty you are Athena! Beautiful selfie! 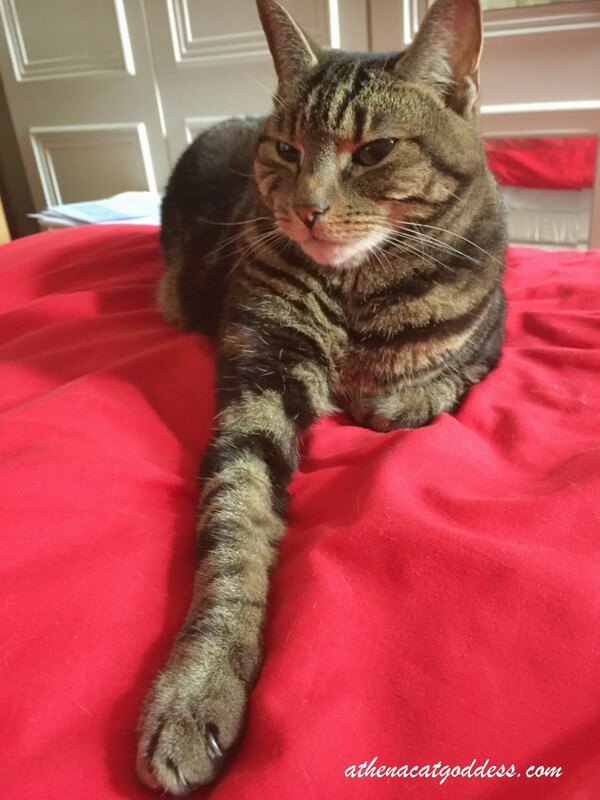 We love that outstretched paw, beautiful Athena! Don't we look the epitome casual elegance mademoiselle!! !